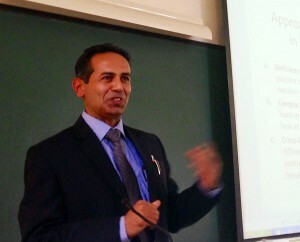 English professor Iswari Pandey speaks at an international conference on writing research. Photo courtesy of Iswari Pandey. Iswari Pandey, a professor of English at California State University, Northridge, has won the 2017 Advancement of Knowledge Award for his book “South Asian in the Mid-South: Migrations of Literacies” from the Conference on College Composition and Communication (CCCC) and the National Council of Teachers of English (NCTE). Pandey’s book analyzes how recent South Asian immigrants form and transform their language and cultural practices as a result of migration and contact with other cultures in the United States. He interviewed more than 70 immigrants representing different walks of life and faith traditions — including Hindus, Buddhists and Muslims — and observed cultural and educational practices at community spaces, as well as presentations by these community members at religious and secular institutions. Writing the book in its current format was not his original plan, Pandey said. “I originally wanted to do a case study, but as I gathered my information, I was getting deeper into the thick of things — deeper into a treasure trove of knowledge about how languages and cultures are recreated as a result of relocation,” Pandey said. “The immigrants were not simply importing their cultures to their new homes. They were also heavily invested in reshaping what their authentic culture should be like, discussing and interpreting different texts, to select the most appropriate ones for their children’s literacy education in relation to history and contemporary culture. Some of the practices Pandey observed during his research surprised him. He said they challenge the accepted wisdom that immigrants, especially the first generation, bring their native culture and eventually blend into the “melting pot” by the third generation. The book also tackles technology’s effects on this paradigm shift. Immigrants use today’s connected global society as an asset, to share their experiences across cultures, he said. “With globalization and new technologies, there’s a two-way exchange of culture and information that has tremendous implications for how cultures transform and language learning takes place today,” he said. According to a press release from the NCTE, the Advancement of Knowledge Award honors “an empirical research publication in the previous two years that most advances writing studies.” The award selection committee praised Pandey’s work as a “robust, engaging read” that articulates a “viable and adaptable methodology to study literacy in motion.” He will accept the award at the 2017 CCCC Annual Convention on March 17 in Portland, Ore. He said he feels honored to receive the award and have his research recognized. He is working on two new books — one focused on global English practices, especially how the language is learned by marginalized student populations labeled “remedial” in higher education. The second book is centered on non-Western rhetoric and knowledge systems, primarily in South Asia. Pandey, who earned a Ph.D. at the University of Louisville, has taught in the U.S. and his native Nepal. He joined the faculty at CSUN in 2013 and has taught courses in writing, rhetoric and postcolonial studies, while also directing the English program in business and professional communication. His love of teaching diverse students and the value of writing instruction serve as Pandey’s major motivations, he said.